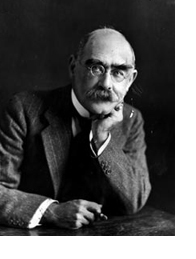 Joseph Rudyard Kipling (1865–1936) is known above all for his stories of India, especially Kim (1901), and for his poetry, but in fact as a writer of fantasy and science fiction short stories he is of considerable importance. Some of his best supernatural tales, such as “The Strange Ride of Morrowbie Jukes” (1885) and “The Phantom Rickshaw” (1885), were written in India. The stories in The Jungle Book (1894) and The Second Jungle Book (1895), can be considered fantasy, as can Puck of Pook’s Hill (1906) and its sequel, Rewards and Fairies (1910). The Complete Supernatural Stories of Rudyard Kipling (1987), The Mark of the Beast and Other Horror Tales (2000), and Kipling’s Fantasy (ed. John Brunner, 1992) have brought much of this material together. There are science fiction stories assembled in Life’s Handicap (1890), in The Day’s Work (1898) and in Traffics and Discoveries (1904), as well as in later collections. His most celebrated science fiction stories are “With the Night Mail: A Story of 2000 A.D.” (1905) and the sequel “‘As Easy as A.B.C’: A Tale of 2150 AD” (1912), which are both about the world peace established by the Aerial Board of Control (A.B.C.). Much of this material has been published in Kipling’s Science Fiction (ed. John Brunner, 1992). See the Encyclopedia of Science Fiction for much more information. Kipling was born in Bombay, the son of John Lockwood Kipling (1837–1911), professor of architectural sculpture in the Sir Jamsetjee Jeejeebhoy School of Art in Bombay, and his wife, Alice Kipling. The two had met at Rudyard Lake in Staffordshire. In 1871 the Kipling family came to England on leave, and when they returned to India they left Rudyard (aged 6) and his sister Alice (3) in the case of a foster family in Southsea. Over five years of cruelty and misery ensued, at least if we believe Kipling’s later account. The only thing that redeemed this misery was an annual visit to his aunt, Georgiana Burne-Jones, the wife of the distinguished painter. In 1878 Kipling was sent to the United Services College at Westward Ho!, in Bideford (Devon), founded only four years earlier, primarily for the sons of those in military service around the Empire. Kipling’s fictional account of the school in Stalky & Co (1899) is still one of the very best boys’ school-stories. He wrote poetry at school; his parents published a collection privately, and without Kipling’s knowledge: Schoolboy Lyrics (1881). In 1875, John Lockwood Kipling moved to Lahore, as Head of the Mayo School of Art and of the Lahore Museum. Kipling was offered a job on the local paper, and in 1882 he returned to India and worked as a journalist in India for six years. His collection of light verse, Departmental Ditties, was published in 1886. The following year Kipling was transferred to Allahabad, to work on The Pioneer newspaper. He published verse and short stories there, and his first collection (set mostly in the popular hill-town for summer retreats, Simla)—Plain Tales from the Hills (1888)—was a great success. In 1888 and 1889 he produced six volumes of collected prose and verse. Kipling determined to seek fame outside India. In March 1889 he left Calcutta for London, via San Francisco and across the USA, arriving in London in October. He wrote prodigiously between 1890 and 1914, and established himself as one of the best known and most popular writers in the English language. In 1891 he set off on a long trip across the southern hemisphere, visiting South Africa, Australia and New Zealand, and visited India for the last time. In Lahore he heard of the death of his American friend Wolcott Balestier, and within days of his return to England in January 1892 he married Balestier’s sister Caroline. Their honeymoon took them to Japan; they then settled in Vermont (where her family lived), and there he wrote the Mowgli stories and much else. He quarrelled with the Balestiers, however, and left the US in 1896. He thought of settling in South Africa, and lived there for a while, befriending the two embodiments of British imperialism, Rhodes and Jameson. During the Boer War he briefly worked for a soldiers’ newspaper, at the suggestion of Lord Roberts. He became convinced that Britain would be unprepared for any future European war. What a disillusion! … Nobody galloped up on a lathered horse and fell unconscious after handing the general the long-awaited dispatch. The general himself bestrode no charger, but sat in a comfortable camp-chair beside a neatly spread tea-table…. And all this method and precision and application of modern efficiency ideas makes the carnage that follows all the more ghastly … The dreadful dead men and the shrieking wounded men … seem to you like innocent bystanders who have got in the way of some great civil-engineering scheme and been torn and blown up (quoted Bradshaw, 83). In 1902 Kipling moved to a seventeenth-century house called Bateman’s, near Burwash in Sussex, where he lived for the rest of his life. He became dependent on the motor car, which he loved. In 1907 he became the first British writer to receive the Nobel Prize for Literature. He hated the Liberal Government, and in 1914 was making inflammatory speeches in defence of Protestant Ulster. The Great War changed all that, and changed the course of Kipling’s life. For the first few years after the War his work was dominated by two things he took on in 1917: his membership of the Imperial War Graves Commission, and his history of his son’s regiment, the Irish Guards. He worked for the Commission for the rest of his life; the History he finished in 1923. Neither he not his wife had good health, and they travelled a good deal to try to find warmth, particularly in France. They continued to live in Bateman’s, and when they were in London stayed at Brown’s Hotel. In January 1936, they were both at Brown’s on their way to the South of France, when Kipling’s ulcer haemorrhaged. He died in Middlesex Hospital and was cremated at Golders Green; a few days later his ashes were buried in Poets’ Corner in Westminster Abbey. I am relying a good deal on Thomas Pinney’s entry in the Oxford Dictionary of National Biography. There are of course numerous biographies. I quote from David Bradshaw’s chapter on “Kipling and war”, from Howard J. Booth, ed. The Cambridge Companion to Rudyard Kipling (Cambridge University Press, 2011), 80-94.